What size is 1/5 scale? What kind of motors are they? Just like your regular run of the mill weed eater. Very Reliable and Dependable. A Stock engine 23cc - 26cc is between 3-4 horse power. Are the parts expensive when you hit something? Your initial cost is high but thats it. After market parts can get pricey but factory parts are usually not that expensive. A little bit more than smaller size R/C. The on road Sportsline long chassis out of the box runs 39 mph. Clocked by a police car. Trucks are about the same maybe a little faster considering the engine is 26ccm instead of 23ccm. These R/C bad boys can reach speeds up to 80mph. What size are the engines? Cars have a 23cc Zenoah, Off Road Monster and stadium truck have a 26cc Zenoah. There is a 30.5 cc engine made by CY for sale on the site. Most cars do. The really expensive ones like the competition EVO don't. You do have to install your own radio gear or purchase some when you purchase car/truck. The radio gear is not that hard to install. We do have RTR kits. This means you get everything. You get electronics installed, body painted, everything you need to just add gas when you take it out the box. WOW! Didn't know you can get it this way! You can. Email with color scheme. 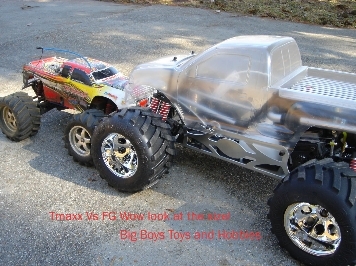 FG is a company in Germany that has been makeing these 1/5 cars and trucks since 1990. They are very easy to get parts for and usually there is no waiting period. I use Maxima synthetic oil in all my R/C cars and trucks. What gas Mixure do I use? Out of the box you will need to run 25:1 gas/oil mixture. This is really rich but good for intial running times. Once you get through your 2nd tank of gas you can bump it up to 32:1 gas/oil mixture. How long will these cars run on one tank of Gas? These cars and trucks will run about 45 minutes on one tank of pump gas. Amazing isnt it. This isnt putt putting around either. What octane gas do I use? I run 89-93 octane in My cars and trucks. They run just fine with this grade of gasoline. Its very easy to purchase also. Shipping is not Free! Sorry but shipping internationally is expensive. Once you purchase we will send you an invoice for the shipping charges. We ship to just about every country except for Singapore. I have shipped to Korea, Dubai, and more.